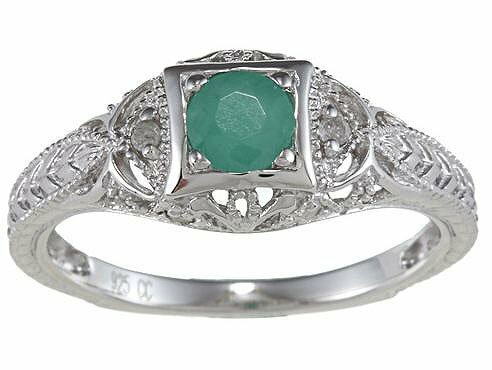 An emerald and diamond engagement ring is one of the most precious and valuable rings available. Many fine emeralds are actually more valuable than diamonds, so when you combine these two magnificent gemstones in one ring, you create a priceless piece of art your loved one will cherish forever. 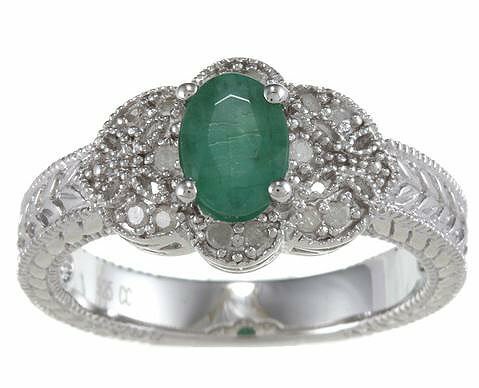 The green of the emerald looks fabulous surrounded by delicate white diamonds set in a beautiful silver or white gold band. In fact, this in one of the most popular styles for setting emeralds and diamonds in an engagement ring, but it is not the only choice. There are thousands of different ways to set a emeralds and diamonds in an engagement ring. The paradox is that some settings are absolutely beautiful, while others are not very attractive at all. The Corina emerald and diamond engagement ring and wedding band set features a large white diamond solitaire as the focal point on the engagement ring, with an emerald on either side. The wedding band has altering white diamonds and green emeralds embedded in the circumference of the ring. 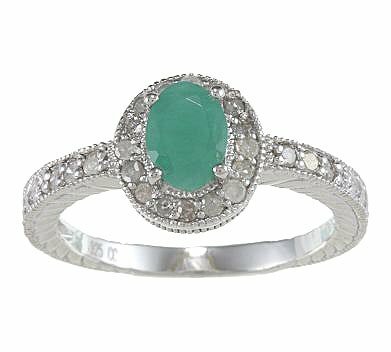 The engagement ring also has altering white diamonds and green emeralds embedded in the remainder of the circumference of the ring. Emeralds are one of the most valuable gemstones. The deep green color is glorious, and the deeper the green, the more rare and valuable the stone. 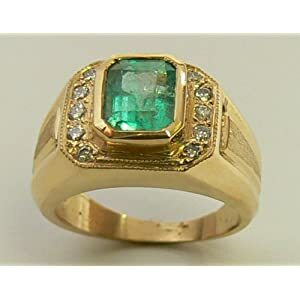 Emeralds are beryl, so paler stones that are not considered valuable are simply referred to as green beryl. Colombia produces the most valuable emeralds. Emeralds are also found in Brazil and Zambia, although the Brazilian emeralds are usually lighter in color than those found in Colombia. The Cat's Eye Emerald if one of the most famous varieties on the market. This type has a cat's eye effect, is quite pale and very rare. It is the rarity that makes it so valuable. One characteristic that makes emeralds unique is their flaws. With most gems, flaws decrease their value, but with emeralds the flaws are generally accepted even in high quality stones. Finding a flawless emerald is extremely rare and when one is found, it becomes very expensive. Most emeralds on the market today are treated with oils and resins to enhance the color and clarity. This makes the stone even more brilliant, but it also makes it necessary to handle the gem with care. Normal cleaning methods, such as an ultrasonic bath, will not work as this will remove its brilliance. You also can not wear your rings when working with soapy water. Since many people can't afford real gemstones, the market for fakes is huge. Reputable companies will tell you right out that the gem is an imitation. Non-reputable companies will try to pass the fakes off as genuine. The average person will not be able to tell the difference, so make sure to have your gems examined by an expert before paying outrageous prices for a fake emerald and diamond engagement ring. If the price seems too good to be true, it probably is. Emeralds are the birthstone May, so if you plan to ask someone born in May to marry you, an emerald and diamond engagement ring is the perfect choice.